With the Spanish stock market falling 20.4% so far this year, Bankia sees shares in its assets column worth some 66% less than in the official accounts. The problem of the ‘toxic’ assets in construction, property, home loans and credits to families and promoters is well commented, but new Chairman, José Ignacio Goirigolzarri, will now also have to manage the shares in other companies the bank owns. Their value is substantially less than reflected in the bank’s accounts and El País reports an audit has put the size of the new black hole at 2.465 billion. Deloitte says that the BFA has put down as fiscal assets the losses suffered, which means that taxes the forecast saving in the future are in the accounts now as real assets. This known as tax credits. 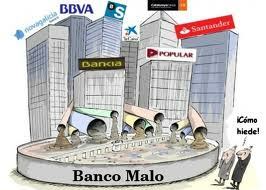 The Spanish Government will impose that some 32 billion € must be put aside in the banks to cover real estate investments. It remains to be seen whether today’s reforms of the financial sector are considered credible by investors, and whether they finally free up the flow of credit. But with this further Government pressure it seems banks will have to release their stock for liquid assets and become more receptive to offers on the prices advertised for their property repossessions. The Spanish Government, Developers and Banks are drawing a common strategy in an attempt to promote Spanish property market abroad, with the UK and German home buyers in the spotlight. Also to encourage buyers investing in property, the Spanish Government says it wants to give more security to foreign property buyers. The pound is at a near three-and-a-half year high against the euro, trading for around 1.20 euros, its strongest rate against the currency since the financial crisis hit in 2008. The property bargains are being offered to market at heavily discounted prices and a window of opportunity has opened up for buyers who want the best property at a reasonable price. Local price cuts in Spain have returned them to good value holiday destination status. Prices have fallen dramatically in Spain over the last 24 months, making the country one of the cheapest for typical holiday spending items in a 36-nation list. We all know the current situation with the property market. Prices have been falling steadily for quite some time now. The more experienced buyers know that a falling market opens the opportunity to buy a bargain that in the medium to long term will become a great investment. We have seen this happening every time the economic circle has a downturn, so this is the best time to buy. For those who don´t know the local market it is difficult to recognise when a property is a real bargain. Here are some tips for anyone who wants to take advantage of the current climate and bag one of those deals before prices climb up again. 1- Firstly narrow down the area. The old cliché of location, location, location is there for a reason. Some areas depreciate less because there are always desirable spots in any case. This coast has different areas that offer different benefits. Decide those "must have" and find the area that covers your needs. You can then become a real expert on the area and track down the correct pricing. 2- Set out a budget from the start and stick to it. There are many properties on offer and it is easy to fall for a more emotional purchase rather than an investment which could tempt you to put your budget up spending more that you need to. 3- It is essential to find a good Estate Agent locally that can guide you through the prices. He will be able to show you comparable properties to those of your interest so you can identify when a price is good. He can also advise you on the average price of the square meter of the area and that will help you to see whether you are in front of a bargain or not. 4- Take your time finding the right property but if you see a bargain in the area you want, within your budget and it makes a good investment buy it there and then. Don´t forget you are not the only bargain hunter out there and if you don´t do it someone behind will, taking away your chance. It is perceived that there should be 1000s of bargains out there but the reality is very different. Private owners cannot afford to lose a lot of money for the sake of a sale and although they want to sell there are not going to give it away. Corporate owners (i.e. banks), tend to repossess those properties that had the highest mortgages (for obvious reasons) and the cost and time to repossess in Spain is very high, making to find a bargain property with them also difficult. Keep your eyes open, work closely with your Estate Agent and be ready to pounce when that opportunity arises.